Browsing Marks and Spencers website this week, I came across these lovely leather jackets for Autumn. Of course, quality is generally guaranteed from here, so although its fairly pricy, its a good investment piece that will last you for years to come and remain stylish and classic too-my fave is the 2nd one, as I like the knitted cuff and waist detailing!! A big thanks to everyone who commented on my leather jacket in yesterdays post too!! Diana was the main topic of conversation, but I just wanted to mention that my brown leather jacket was £4.99 from the Salvation Army, I thrifted it about 3 weeks ago!! It has quite a worn in look and feel, is very light and soft and I like how I can push the sleeves up on it too! So, if you are after a leather jacket for Autumn, don't forget to thrift first-you will most probably be able to get a stylish cheap bargain if you look hard enough! I'm liking your thrifted jacket best of all - I did product test the first M&S jacket and it didn't stand up to my expectations of a good jacket. The leather was too stiff and the cut seemed wrong! Hi kate-thanks for your lovely comment-it doesn't surprise me what you've said about the M&S jacket, it does look stiff and awkward looking on reflection, the 2nd one looks much better. Have a great weekend! Lucky you! I am still looking!! Anyways I had to work overtime, on a friday(!!) but managed to catch a flea market on my way home and scored some bargains. No leather jacket, but still good. Have a wonderful weekend! I am dying to wear the Christian Dior leather jacket that I got at Mrs Sting's sale! Hi Silje-so working late had its compensations by catching the flea market, haha!! Well done on your finds too and have a great weekend! Hi Wendy-yes, it looked gorgeous when you wore it for dinner in the Axis restaurant, its a truly fabulous find!! the jacket looks great! what a bargain! As soon as I'd go to UK you have to give me advice because I've never buy as cheap as you there! it's incredible!! Super super jacket! I'm so in love with it. Congrats! oh, the Mrs. Sting sale lives on, what bargains! Too bad about the first jacket, the second one looks like it'd be softer?? Sharon, you are the thrifting goddess, what a price for that cute jacket. Oh my goodness! 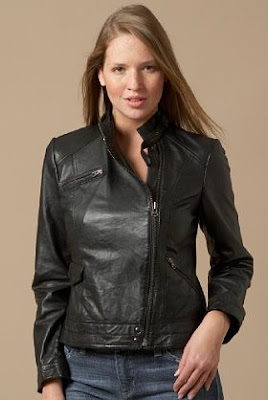 I love leather jackets but I'm not sure how it will turn out of I wear them back in the tropical Philippine islands! heehee.. I love your jacket! That's a good buy!!! Hi atelier-haha, I think its just my love of the charity shops and boot sales we have that I'm lucky to source my bargains-thanks!! Hi bert-so lovely, thanks a lot and have a good weekend too! Hi fashion herald-thanks for your lovely comment, Wendys leather jacket from Mrs Sting is a treasure, lucky girl! Hi theworldismycatwalk-so lovely, thanks my dear! I can't believe you got that at Salvation Army, it's really nice! I really like the Autograph jacket. Hi nay'chelle-thanks so much!! Have a great weekend! Your jacket is so much nicer. It looks so much better on you than the jackets on the models. Hi ariel-thats such a nice comment, thanks a lot! I can't wait to wear my own leather jacket in winter! Hi nadine-Our weather is soo changeable, I can start wearing mine now, thankfully! Hi jen-good luck hunting for one and have a great vacation! i think this jacket fits your perfectly. it looks great. Hi fashion is poison-thanks so much for your lovely comment!! I know I'm late, but that leather looks just great on you. It's beautiful and thanks so much for the advice. I will definitely thrift when I shop for mine. Hi cheryl lynn-haha, better late than never, thanks so much for your lovely comment! !